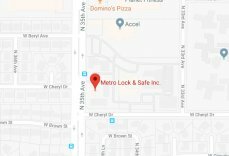 When To Have Your Locks Changed | Metro Lock & Safe Inc.
Posted on August 30th, 2013 by Metro Lock & Safe Inc.
Locks are an important part of everyday life, keeping your family and your possessions safe from burglars and other hazards. There are some times when it is essential to change your locks in order to keep a high level of security around your home. It may seem obvious to change your locks after a break in, but that is only because it is the absolute right thing to do. Changing the locks after a break in gives your home more security and lets you feel safe coming home again. No matter how much you trust the other person, after a break-up emotions can lead to crazy things. Change your locks to keep any difficulties with ownership of possessions to a minimum. A break-up is never easy, but coming home to find your belongings gone will only add to the turmoil. Again, you may trust this person completely, but spare keys can be lost or misplaced. To be safe it is best to change your locks after a roommate has moved out. Starting fresh with new locks after a new roommate has moved in or even after moving out by yourself will give you more peace of mind and a greater sense of security. Whether you get your key back or not, it is a good idea to change your locks after a neighbor has watched your house for you. Whether you were on a vacation or simply needed something in the house checked on quickly, you cannot know who else may have had access to your keys. If you are moving into a new home or apartment, changing the locks should be one of the first things you do. Unless you had your new home built, you do not know how many other people have been there before you. There is no way to know if the previous owners gave out spare keys to people. It is much better to play it safe and change the locks so there are no future issues in your new place. Even if you’ve had no bad experience with your current locks, it is smart to have them changed after a few years. Locks can become worn and difficult to use, and there may be better technologies available that could work better for your home and security needs. Some locks can become obsolete over time, making them far easier for burglars to get through. Changing the locks every few years ensures you are up to date and keeps your home safe from any outside threats.